Anne Curtis met one of her K-pop group idols just before her birthday this month. 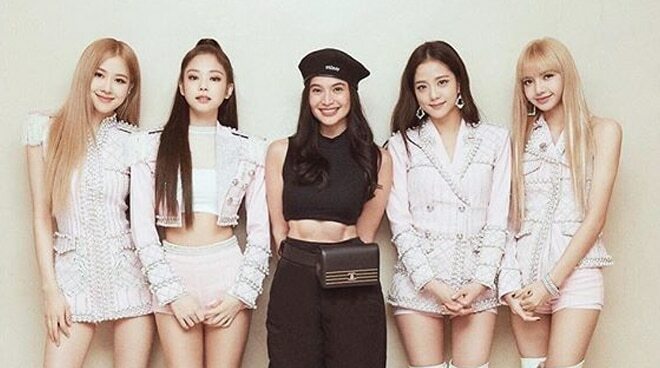 The Kapamilya actress posted her photo with Blackpink on Instagram on Friday, reminiscing the once-in-a-lifetime opportunity she had a few days ago when the girl group had their concert in Manila. Anne added that she is very thankful that she wore a black outfit when she met the girl group. She said "P.S was so happy I decided to go for an all black outfit. [Blackpink] represent!," she wrote. Happiest early birthday gift. Happiest 언니 too! I wanted to say so much but ended up being soooo speechless the moment I shook your hands 😂. Thank you @roses_are_rosie @jennierubyjane @sooyaaa__ @lalalalisa_m. You guys were amazing and made so many Filipinos extremely happy! Special thanks to YG Entertainment @blackpinkofficial and @mmilive for making this happen. . . P.S was so happy I decided to go for an all black outfit. 🖤💗 represent!